With Mozart’s late symphonies now newly familiar to me, I thought I would turn to something that was already familiar, Piotr Ilyich Tchaikovsky and his Symphony No. 4 in f minor, Opus 36, as I continue my journey through Michael Steinberg’s The Symphony. Tchaikovsky was my gateway drug for classical music. And Eugene Ormandy and the Philadelphia Orchestra were my dealers. I have this memory from my teenage years of a cassette tape given to me by a friend that had Tchaikovsky’s 1812 Overture on one side and the Serenade for Strings on the other. I listened to it again and again and am so stamped by the latter performance, that it’s difficult to hear it played by anyone else—“That’s not how it’s done.” Oh, those strings. It was the Tchaikovsky Violin Concerto that really hooked me, though. I remember watching a performance on television and being mesmerized. 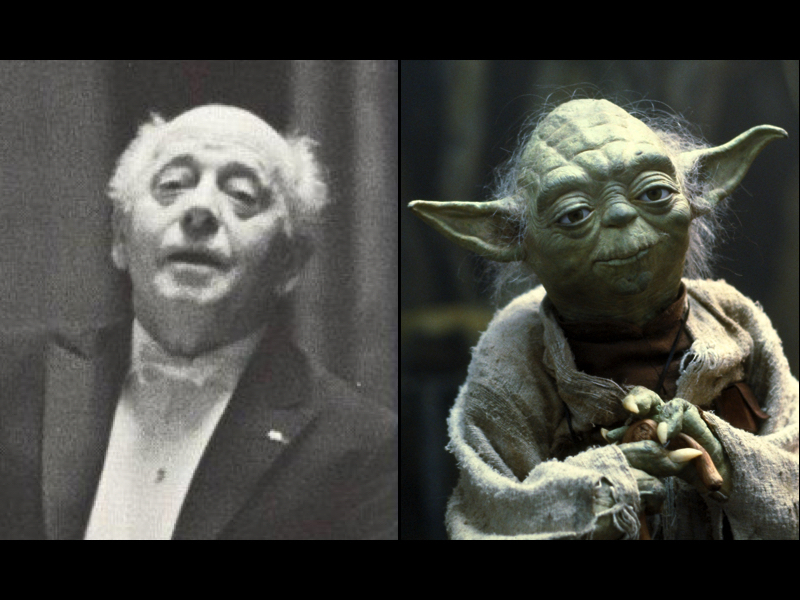 Let’s be honest (and no disrespect intended—it was the late 70’s and Star Wars was a thing for the first time), Ormandy looks a bit like Yoda (well, not the ears or the skin tone), so how can you not have warm feelings about him? With Symphony No. 4, you don’t need to know that the opening is a “fate” theme, to understand that it’s pretty intense. Tchaikovsky obviously has a flair for the dramatic. There is no dispassionate, “Let’s play it cool,” with him. It’s all fire and ice. More of the ideas behind the music later. 1. He writes great tunes. Especially in the Fourth Symphony, that little tune in the second movement that begins with the oboe is so lyrical and haunting. 2. There’s also a mysterious quality to his tunes. He is other-worldly, though not in the spiritual or “far-out” sense. He is writing in the German symphonic tradition begun by Mozart, Haydn, and Beethoven, but his tunes come from another place—and not just Russia. There is an Italian lyricism that can be heard as well. (Obviously, someone from Russia will find less of “another world” in Tchaikovsky’s melodies, or perhaps they will find his music other worldly in the sense of not being from Russia, particularly, because of the German-Italian connections.) One of Tchaikovsky’s gifts is creating tunes that sound like folk music even when they are original. 3. There are wonderful colors in his orchestrations. Obviously, since the time of Mozart the orchestra has gotten bigger and included more instruments and those instruments have gotten better. Tchaikovsky exploits this to full effect. This Fourth Symphony is phenomenally colorful with all sorts of instrumental solos and pairings. The third movement where the strings play pizzicato exclusively is magical. 4. Tchaikovsky’s rhythms are exciting. On the one hand they are primal, with toe-tapping and cymbal-crashing pulses, and on the other hand they are sophisticated and modern with highly syncopated passages. My affection for Tchaikovsky’s music has cooled somewhat over the years replaced by a near-obsession with Gustav Mahler, but I felt so much nostalgia as I listened to this powerful symphony. I turned to a performance on video I found on a used shelf some time ago of Michael Tilson Thomas and the San Francisco Symphony as part of the “Keeping Score” program on PBS. I enjoyed this, although I will say that the production quality of this program has improved dramatically in the years since this 2004 episode. (For one thing, moving from 4:3 to 16:9 aspect ratio.) There are two elements to these shows—a documentary about the featured work and a concert performance of that work. The first Keeping Score program I watched was about Gustav Mahler (from 2011) and it’s clear that Thomas (hereafter, MTT) went to some incredible lengths (including travel to Mahler’s homeland) to tell a compelling story. With Tchaikovsky, the focus is more local, on the music-making process and, in this case, on the group of people from the San Francisco area who come together to make music at a very high level. Rehearsal and performance sequences are interleaved with vignettes featuring some of the orchestra’s principal players. If the production values and story-telling characteristic of the documentary weren’t as good as with Mahler, happily, though, the audio and visual aspects of the performance of Tchaikovsky’s symphony were excellent. 1. Weeks before the performance, MTT, the conductor and artistic director of the San Franciso Symphony, went through his score and marked things, which wasn’t surprising. But then his score went to the orchestra’s librarian who marked the individual parts based on his notations in his score. It’s a time-saver at rehearsal. I can’t imagine this always happens—for example, I can’t imagine every guest conductor sends a score in advance for parts to be marked. Then again this is a world that is foreign to me. You also get to see the disciplines of a number of the players, for example William Bennett, the former mentioned principal oboist, as he makes reeds, and David Herbert, the tympani player, as he prepares imported natural skins for performance. Like athletes and actors, with musicians there’s a lot you don’t see that has to happen before they take the stage. Thomas says the end of the first movement is “total burnout” emotionally, psychologically, and acoustically and yet the symphony isn’t over. MTT offers the insight that Tchaikovsky writes for the winds as singers in an opera. MTT says Tchaikovsky explores “playfulness” in this movement. It’s marked “Scherzo (Pizzicato Ostinato). (A joke. Plucked strings primarily going on continously.) This movement is a delight and MTT notes “It needs precision, elegance, and endurance to make this work.” Had anyone ever done this before Tchaikovsky? This feels sort of ground-breaking. The idea for having elements from earlier portions of a symphony return at the end started with Beethoven. With Tchaikovsky, the fanfare doesn’t quite bookend the symphony (it does on the front half), but it’s impressive how the happy and frantic fourth movement revelings transform back into the “fate” theme. As far as the actual performance by MTT and the San Francisco Symphony, the playing is phenomenal. For purposes of comparison, I went back and listened to Eugene Ormandy and the Philadelphia Orchestra. Nothing wrong with either performance, but they are stunningly different. Mainly, production quality has changed, which (and I think there is a chicken and an egg scenario here in that it’s hard to say which came first) has changed performance quality. It’s not that the San Francisco Symphony plays better, but perhaps more cautiously as there are absolutely no rough edges. SFS Media, which records the San Franciso Symphony, does a phenomenal job. I would say that Ormandy has more of his heart on his sleeve, but Thomas has a more perfect presentation of the music, at which point you have to choose what you care about. I thoroughly enjoy the Ormandy performance for its sense of rawness and emotional power. I think I’m beginning to understand how to listen past the recording limitations of the time to the performance underneath. The difference between analog and digital recordings feels a little bit like the difference between old school black and white photography (the real kind—à la Ansel Adams) and modern color digital photography. The color pictures are better, but are they better pictures? 1. He was a homosexual in an environment—family, society, and country—where there was tremendous pressure not to be one. 3. Prior to his marriage he found an admirer in Nadezhda Filaretovna von Meck, a wealthy widow who was obsessed with Tchaikovsky’s music. She subsidized him for more than a decade so that he lived comfortably. They maintained an intimate and “voluminous” correspondence, but they never met (von Meck’s wishes). Following the break-up of the marriage, Tchaikovsky was a mess. His “relationship” with von Meck helped him pull through. As he worked on the Symphony No. 4 (begun before the marriage), he wrote to von Meck saying, “Our symphony progresses.” Ultimately, he dedicated it to her. I believe in the supernatural, but I believe we make and live our choices. Hard to imagine Mozart saying that about one of his symphonies. He seemed more detached, separate from his art. I think I remember him expressing the hope regarding one of his symphonies that it would delight listeners. This seems to be a sea change: From music to enchant and entertain to music to express myself. As I was writing, I did a search to look up the name, William Bennett, the then principal oboist for the San Francisco Symphony, who is featured on this edition of Keeping Score. I was saddened to learn that he died in 2013 while performing Strauss’ Oboe Concerto with the San Francisco Symphony. In the Keeping Score documentary, Bennett describes Tchaikovsky as a “tremendously conflicted and complex emotional person.” And then he quickly adds, “And we all are.” Tchaikovsky’s detractors would say that his music is too emotional. Is there any music emotional enough to express the anguish of a too-young death of an incredibly talented musician in such a tragic way? There is something just so poignant, now, about that oboe solo in the second movement. R.I.P.